I simply can’t get enough of wild Alaskan salmon. On a recent shopping excursion I faced two choices, typical rose-colored filets and ghost-white filets called “Ivory” salmon. I lunged for the Ivory, a rare find with unique buttery flavor. When another shopper asked about my choice, I assured her it was succulent and that the color was diet-related….but…. I realized I needed to bone up on this bone-colored delicacy. A little research (see References below) helped. Ivory kings are pricier because there are fewer of them; only about 5% of wild king salmon are white, although the incidence is higher in some Alaskan locations. Demand has grown as more chefs and seafood-lovers discover that what these fish lack in color they make up in toothsome texture and richness. Astaxanthin is the pigment that gives salmon, lobsters and flamingos their distinctive color. A member of the carotenoid family, astaxanthin is related to the pigments that make carrots orange and tomatoes red. It is produced by phytoplankton, which are eaten by small crustaceans such as shrimp, krill and crabs that salmon eat. Ivory colored salmon have a genetic defect so they can’t metabolize these pigments and store them in their flesh like other salmon. This genetic defect is recessive and only occurs in king salmon (not sockeye, pink, chum or silver salmon) so Ivories are rare. While they lack potentially health promoting pigments, Ivory king salmon are rich in omega 3 fatty acids, just like pigmented kings. See my blog post about Copper River Salmon for more on salmon nutrition. 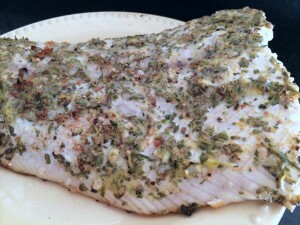 Before grilling, I slathered the surface of my Ivory filet with a seasoning with origins in Southern France, Herbes de Provence, blended with lemon, olive oil and Dijon mustard. While lavender may not appear in classic French versions of Herbes de Provence, it adds a subtle summery fragrance to this seasoning and doesn’t overpower the fish. 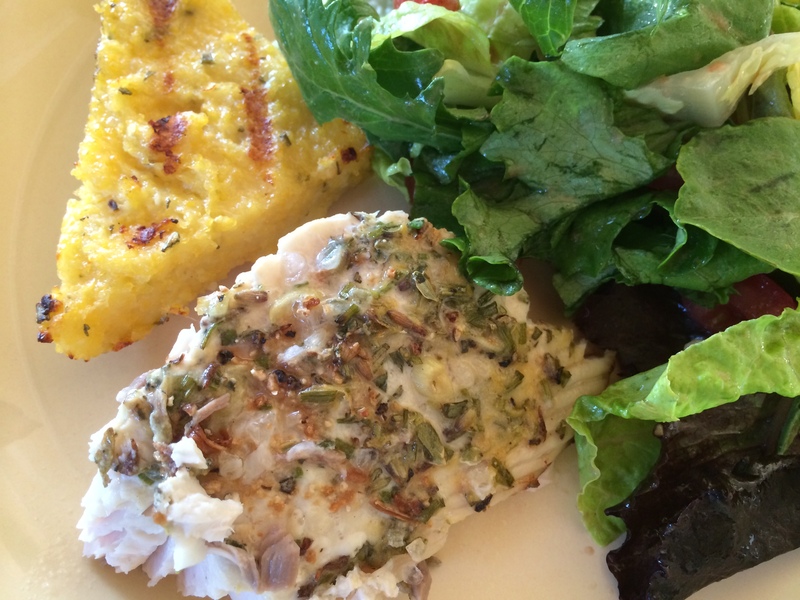 Serving suggestions, shown in the first photo, are grilled Polenta and a green salad. You can purchase jars of dry Herbes de Provence blends but in the summer I like to use fresh herbs. A rule-of-thumb when substituting fresh for dry herbs is 1 teaspoon dry=1 tablespoon fresh. Combine all ingredients and spread over fish filets before cooking. Makes enough for 2 to 2 1/2 pounds fish filets. 1. Smart Shopping for Salmon, Tufts University Health&Nutrition Letter, June 2014 p. 4-5.